Liana was ranked 465 in 2015 US female names list and elevated by 8.82% from its previous ranking of 510 in 2014. Diminitif Emilienne, Emiliane. The Latin "aemumlus" Means "emulates" If Day January 5. A little milk soup, very emotional,Lianareact like clockwork. Liana lack a little confidence, making them sometimes aggressive. Liana often take refuge in their dreams to escape reality. Sensitive, charming, very feminine, charming their devastating affects their love life is a little jagged. Liana is a rare first name for a girl in England & Wales which is a rare name since 1996 and ranked 597 in 2014. Only 737 people have Liana as their first name. Liana is a very consistent name over the past 18 years. Liana is a very very popular first name for a girl in United States which is popular since 2002 and ranked 465 (0.014917% bearer) in 2015 in US. Around 13689 people wear Liana as their first name. Liana is a rare first name for a girl in United States which is a rare name since 1929 and ranked 465 (0.014917% bearer) in 2015 in US. Only 13689 people have Liana as their first name. Liana is not a native United States and Liana may be came from another language or is a short form of some other name. 0.003829% of people in US have this given name. 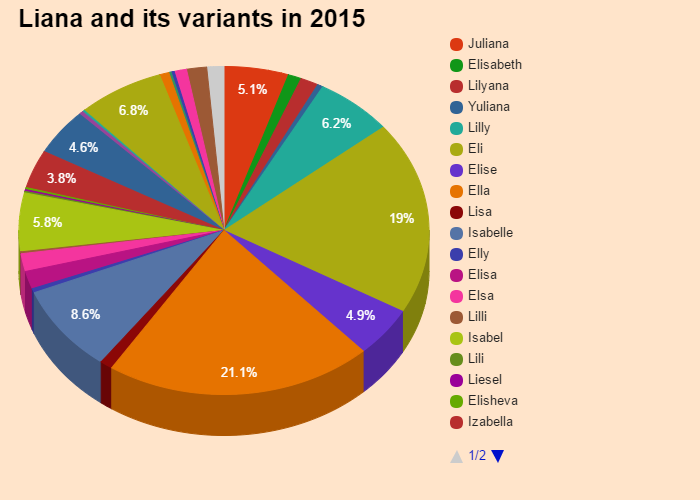 Expression number of Liana is 1. Liana loves adventure and independence and possess determination and originality. Liana generally leads and direct others and likes to establishes their individual identity. The classic girl name first appeared in 1929 when 6 babies had Liana as their first name, the baby name went as low as 5 in 1935. At peak, Liana was given to 680 (0.036%) girls in 2016 specifically in California where 109 babies were named Liana after continuous rising. After it's 88 years long runand 2 instances of disappearance, Liana is currently rising in the chart. Get the meaning of Liana and celebrities who also shares the same name and some names related to Liana, english baby names list, list of names in english. Know what does Liana mean? This website serves as the extended english names list which will help in naming your child.